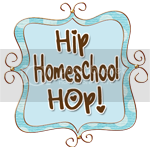 For this week's Hip Homeschool Hop, I'm asking about homeschool open houses! Does anyone else do them? No one else in my extended family homeschools and many of them are curious about what we do and how things work. I'm tentatively planning one for next month and I just wondered if anybody who's done one has any suggestions or good ideas. That would make for an interesting evening - I've never thought about that before... Would love to hear your results if you decide to do one! Stopping by to say "hi" from the Hip Homeschool Hop!